Although the farthest planet is over four billion kilometers away from the earth, all eight planets can be seen in the night sky, using a telescope or binoculars - as long as you know where to look! 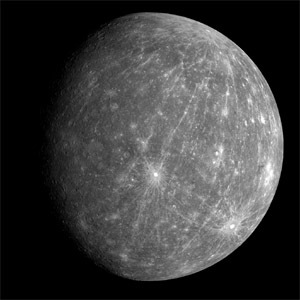 Mercury is the closest planet to the Sun, and the smallest planet of the solar system. Mercury has been visited by two unmanned NASA space probes, Mariner 10 and Messenger. The unmanned Messenger proble was launched by NASA in 2004 and will begin to orbit Mercury in 2011 after several flybys. The picture on the left is a picture of Mercury that was taken by Messenger in 2008, and transmitted back to earth for scientists to study. Mercury is 57,900,000 km away from the sun. 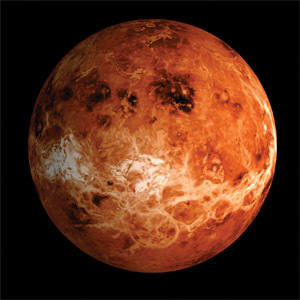 Venus is a very similar size to the Earth, and like Earth, is made of a thick silicate mantle around an iron core. It has a substantial atmosphere and evidence of internal geological activity. Venus is probably the planet that is most similar to Earth in many ways, although it is much drier than Earth and its atmosphere is ninety times as dense. It is the hottest planet in the solar system, with surface temperatures over 400 °C. This is thought to be because of the amount of greenhouse gases in its atmosphere. Venus is named after the Greek Goddess of Love and Beauty. Venus is 108,000,000 km away from the sun. Earth is the largest and densest of the four inner planets, the only one known to have current geological activity, like earthquakes and volcanoes. It is the only planet known to have life. Its liquid hydrosphere (oceans and seas) is unique among the terrestrial planets. Earth's atmosphere is radically different from those of the other planets, having been altered by the presence of life so it now contains 21% oxygen - which humans need to be able to breathe! It has one natural satellite, the Moon, which is the only large satellite of a terrestrial planet in the Solar System. The Earth is 150,000,000 km from the sun. Mars is smaller than both Earth and Venus. The first spacecraft to visit Mars was Mariner 4 in 1965. Several others followed, most recently in 2008, when Phoenix landed in the northern plains to search for water. Three Mars orbiters (Mars Reconnaissance Orbiter, Mars Odyssey, and Mars Express) are also currently at work studying Mars. 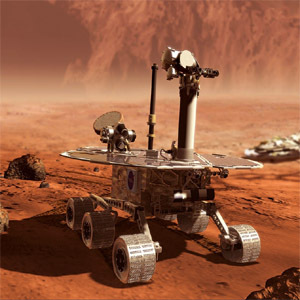 NASA has landed several unmanned robotic probes on Mars, most recently two remote controlled car-like robots called Mars Rovers. These probes allow NASA scientists to explore the planet, take pictures, analyse soil and conduct experiments. The picture on the left is of one of the Mars Rovers on the surface of Mars. Mars is named after the Greek God of War. It is sometimes also called the red planet, because most of its surface is covered in reddish rocks, dust and soil. Mars is 228,000,000 km away from the sun. Jupiter is the biggest planet in the solar system. It is 2.5 times the mass of all the other planets of the solar system put together! 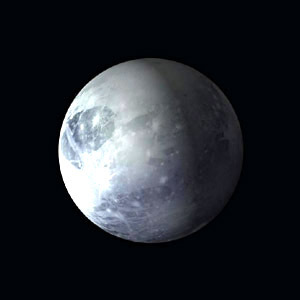 It is a gas giant, rather than a terrestrial planet, and is made largely of hydrogen and helium. 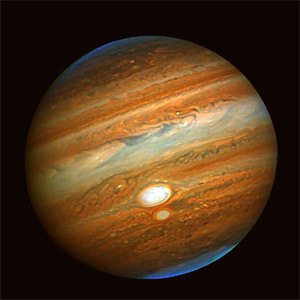 The large spot on Jupiter is actually a storm that has been raging for several hundred years! Jupiter was first visited by Pioneer 10 in 1973 and later by Pioneer 11, Voyager 1, Voyager 2 and Ulysses. The unmanned spacecraft Galileo orbited Jupiter for eight years. In 2003 Galileo was crashed deliberately into Jupiter, to stop it from impacting on Europa, one of Jupiters moons that scientists believe may harbour some basic form of life. Jupiter is 779,000,000 km away from the sun. 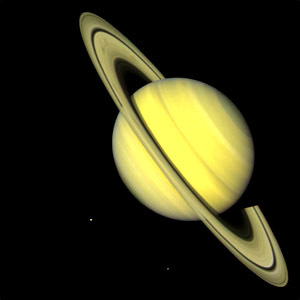 Saturn is distinguished by its extensive ring system, but otherwise has several similarities to Jupiter. They are both gas giants. Saturn has at least sixty known satellites; two of which, Titan and Enceladus, show signs of geological activity, though they are largely made of ice. 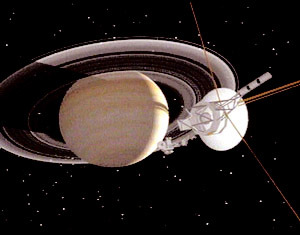 Saturn was first visited by NASA's Pioneer 11 in 1979 and later by Voyager 1 and Voyager 2. Cassini (a joint NASA / ESA project) arrived on July 1, 2004 and is still in orbit now. Saturn's rings are extraordinarily thin: though they're 250,000 km or more in diameter they're less than one kilometre thick. The ring particles seem to be composed primarily of water and ice, but they may also include rocky particles with icy coatings. Saturn is 1,430,000,000 km away from the sun. Uranus is the lightest of the outer planets, a type of gas giant that some scientists call an ice giant. As you can imagine from this nickname its atmosphere is very cold - the coldest in the solar system. The wind on Uranus can blow at over 500 miles per hour! It was discovered by William Herschel, a famous astronomer, while systematically searching the sky with his telescope on March 13, 1781. Uranus has been visited by only one spacecraft, Voyager 2 on Jan 24 1986. The picture on the left is an enhanced image of Uranus that was beamed back to Earth by Voyager 2. Uranus is 2,880,000,000 km away from the sun. 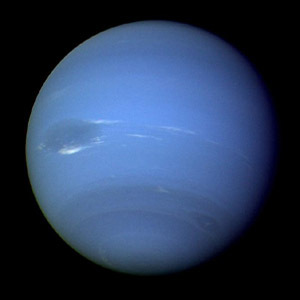 Neptune is the outermost planet of the solar system. It is slightly smaller than Uranus. Neptune has also been visited by only one spacecraft, Voyager 2, on Aug 25 1989. Neptune has a mark on it that looks very similar to Jupiter's great spot. Just like Jupiter, this is caused by violent storms. The weather is very extreme on Neptune - the wind on Neptune is the strongest on any planet, and blows at 1,300 miles per hour - as fast as a jet fighter plane. 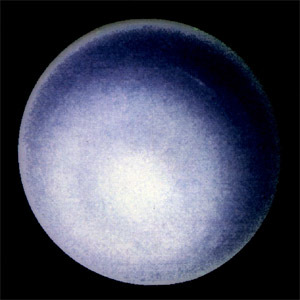 Neptune is 4,500,000,000 km away from the sun. Pluto used to be classed as a planet of the solar system, but is now considered to be a dwarf planet, and a part of the Kuiper belt. The Kuiper belt is a vast collection of dwarf planets, asteroids, rocks, ice and dust that circle the sun, that extends for millions of miles beyond Neptune, on the outskirts of the solar system. The Moon is not a planet at all. It is one of more than three hundred smaller celestial bodies that circle the planets of the solar system. The Moon was the first such celestial body that people knew about - it was always visible from earth! After 1665, when astronomers observed moons around other planets, the word moon started to be used as a collective term for them all. Scientists know more about the Moon than any other planet or celestial body in the solar system, because it is the only other world that humans have ever visited. 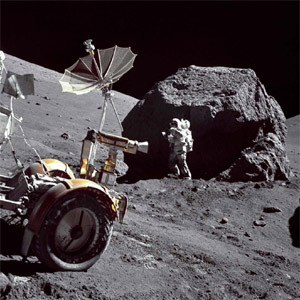 Between 1969 and 1972, twelve astronauts visited the Moon, exploring, experimenting and collecting rocks and soil, to help us learn more. The Moon has a gravitational pull on the Earth, and it this that causes the tides of the oceans. The Moon's latin name is "Luna", and it is around 240,000 miles away from the Earth. So how big is the solar system? NASA launched an unmanned space probe in 1977, called Voyager 1. 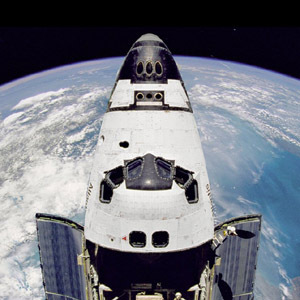 Its job was to fly away from Earth, through the solar system, visiting planets on the way, sending back pictures and information for NASA scientists to study. Voyager has sent back pictures of Jupiter and Saturn, and is still travelling away from earth. It is now the farthest travelled space craft ever launched. Voyager 1 is fast - it covers around 17 kilometres every second. Despite its incredible speed, it did not pass the last planet of the solar system until 1990.By early 2009, Voyager 1 was over ten billion miles away from the sun! Find out even more about the solar system on the BBC's interactive pages here!